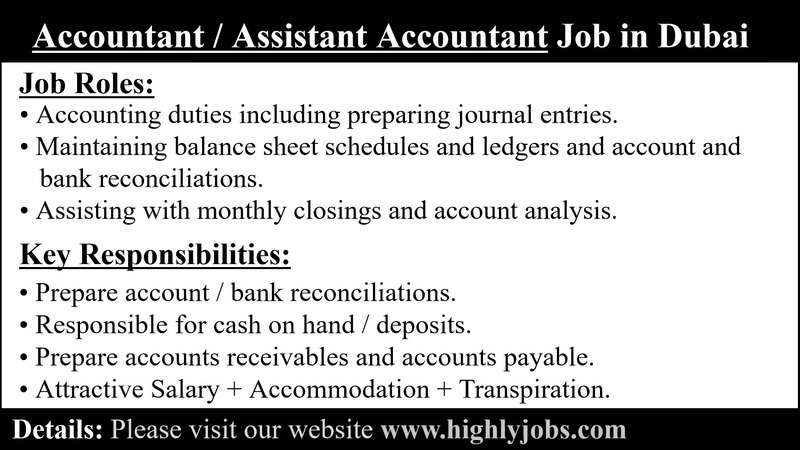 · Accounting duties including preparing journal entries. · Maintaining balance sheet schedules and ledgers and account and bank reconciliations. · Assisting with monthly closings and account analysis. · Prepare accounts receivables and accounts payable. · Assist in budgets and forecasts and monthly payroll process. · Prepare account / bank reconciliations. · Responsible for cash on hand / deposits. · Provide typing and word processing of various documents, letters and electronic information. · Attractive Salary + Accommodation + Transpiration. Please contact to following given number.